While the prior results reflected Rincon Hill residents’ points of view, the link to the survey has been shared more widely at this point in time. The survey makes a point of not asking whether a respondent supports or opposes the proposed Navigation Center at Seawall Lot 330 (Embarcadero and Bryant Street parking lot) – it seems a bit premature without first hearing the plans at the Port Commission or the evening meeting at Delancey Street Foundation on Tuesday, March 12, 2019. I put together a survey to try to help policy makers and other neighbors take the temperature, so-to-speak, and try to learn what concerns exist and what the City could do to help ensure the success of the Navigation Center without harming the Rincon Hill, South Beach, South Park, and other nearby residential enclaves. Here are my neighbor to neighbor survey’s results as of Sunday night, March 10, 2019 around 9:45pm. Hope you have the time and opportunity to attend the meeting at either the Port Commission on Tuesday 3/12/2019 at 3:15pm at the Ferry Building, 2nd Floor, Port Commission Hearing Room or the informational meeting at Delancey Street Foundation at 600 The Embarcadero from 6pm – 7:30pm, also on Tuesday, 3/12/2019. I hope policy makers start talking on Tuesday about what service increases they will be ensuring to the community. Unfortunately, there is a long history of broken promises …. like the Guy Place Park that we’ve been waiting 13 years to see built, like the return of the 12 Folsom bus that got rerouted to stop servicing Rincon Hill on December 5, 2009, and like the promise of accessing property tax increment from the Rincon Hill Infrastructure Financing District (formed in the spring of 2011) to speed up the buildout of parks and other public amenities in the neighborhood if the neighborhood created a Community Benefit District. Well, Rincon Hill created the East Cut CBD, property owners tax themselves about $4 million per year in addition to their regular property taxes, and the City broke its promise (thus far) – so there is some context for the mistrust, at least from the Rincon Hill side of the Bay Bridge. 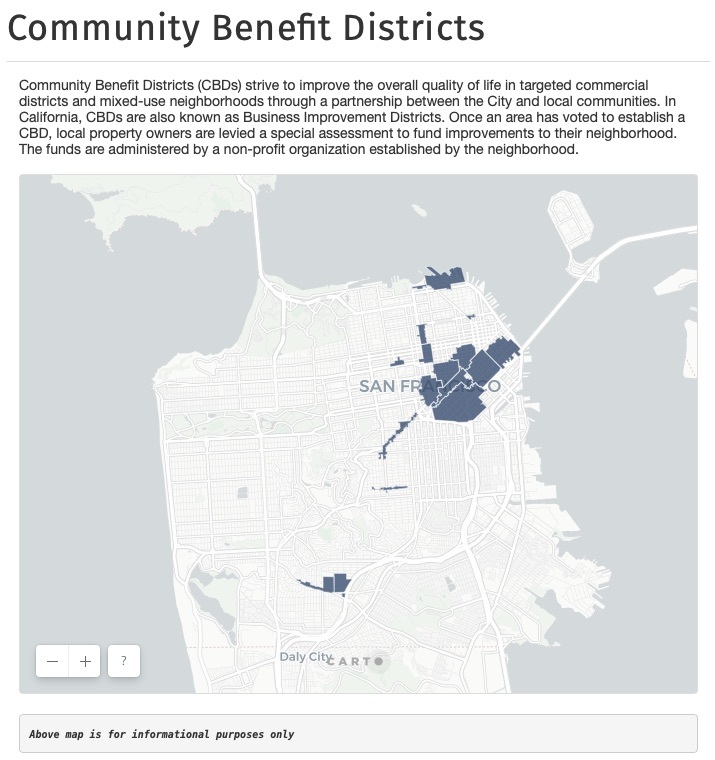 The map of San Francisco’s Community Benefit Districts came from the Mayor’s Office of Economic and Workforce Development website. Note that CBDs were originally formed by commercial corridors to help boost economic growth for businesses. What is SoMa’s commercial corridor exactly? I honestly don’t believe SoMa has a commercial corridor at present outside of maybe 2nd Street.